Larry - Can YOU Help America By Telling YOUR Connections to Ask for Investigations? Subject: NISSAN Whistleblower Letter to Senator Finney and Senator Jack Johnson. Senator Finney's office THANK YOU for having your office contact me and then reaching out to Senator Jack Johnson in reference to my email asking for voices to help communicate the need for NISSAN to mediate. The abuse of the whistleblower is "real". The bullying and harassment I've received for speaking out against discrimination and wasted spending of taxpayer money has been documented. The fraud in reference to the Leaf EV is real. 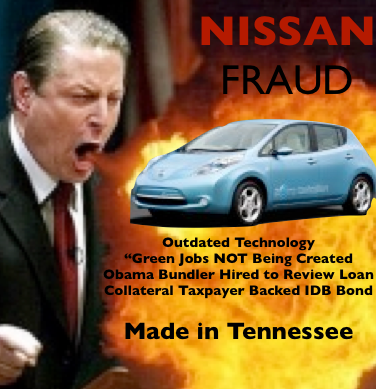 I could not file a False Claims lawsuit against Nissan because of the "trumped up" charges against me and also because the collateral for the NISSAN leaf loan is a tax payer backed IDB bond. Sadly I see no need for me to talk to Mr. Johnson since he has known about the me and my whistle blowing and has done nothing. Although when he see's me at Republican events is always polite. My goal was to get this resolved quietly and I wanted NISSAN to mediate. I filed a Malicious Prosecution case on July 19th. NISSAN delayed responding and NOW they say the DA is responsible for EVERYTHING. I was told Terry Wood the ADA is accepting 100% responsibility, he's doing an affidavit. That's ridicules. From the beginning NISSAN hired Joe Baugh the former DA for Williamson County and for NISSAN to say they had "no" part in the Malicious Prosecution of me is insane. If a reporter looks at what NISSAN just filed (weeks before the election) they'll see a documented drafted to Slander me some more. I will offer to reporters copies of the court transcripts. People that have read the find the fact the case got to trial beyond bizarre. Sirs, this has gone on for over 3 years next week I'm going meet with "non biased" people in the DOJ. I'm a Republican but also an American and luckily I think if Eric Holder keeps his position he might NOW investigate. His office needs to find out HOW a whistle blower who spoke out about the abuse of FEDERAL taxpayer money could be "railroaded" in the Tennessee courts. For me to endure 3 arrest - 19+ months in the courts system is insane. My web stats show that many companies that took Stimulus money from the same program as NISSAN read my blog. 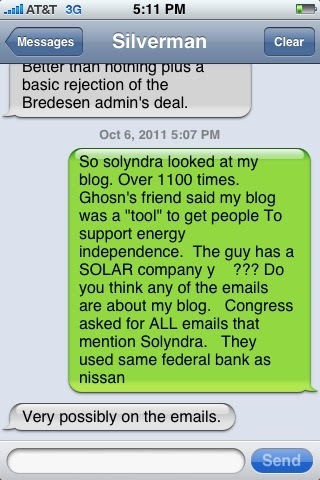 Oddly Solyndra read my blog EVERYDAY I was arrested. FYI- This summer at the RNC convention in Tampa I was told by a congressional staffer that Darrell Issa had a team working on the NISSAN fraud. Maybe when I'm in DC next week someone will give me an update on that. For over 3 years I've been slandered and made employable by NISSAN. 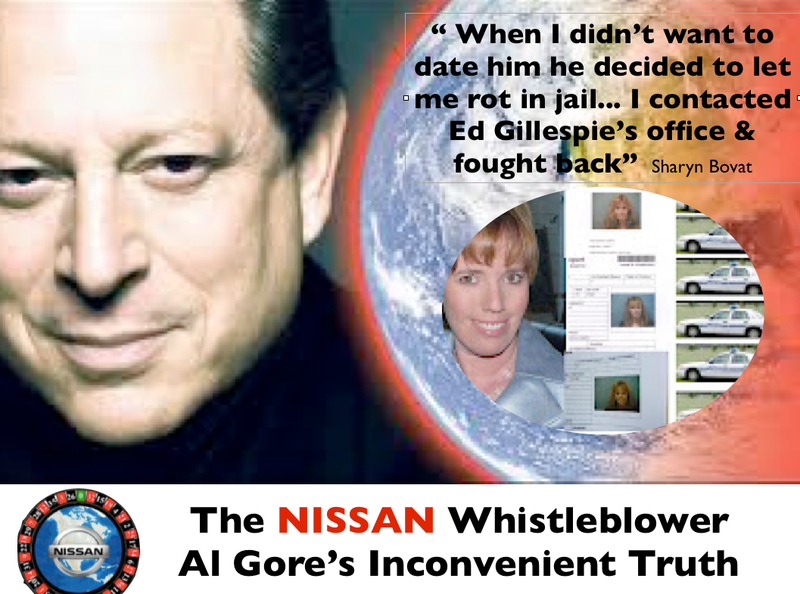 The discrimination I told Carlos Tavares who was the President of NISSAN America was proven by the companies internal statistics (women in management went form 20.9% in 2006 to 10% in 2009 the year I whistle blew. Just recently NISSAN did a press release saying women in management since 2009 has gone up 75%. 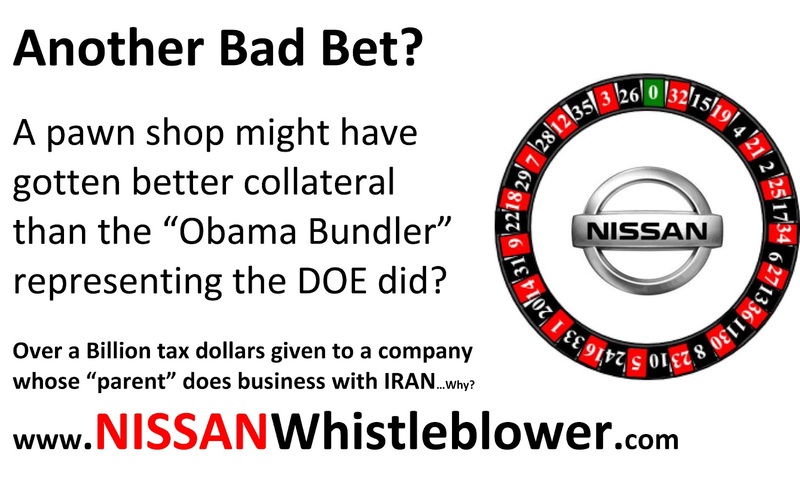 Also - I was outed by NISSAN for doing "research work" for operatives connected to the CIA & the DIA. It's been explained to me that since the people were connected to the CIA that ordered the excessive retaliation of me that too can be investigated. 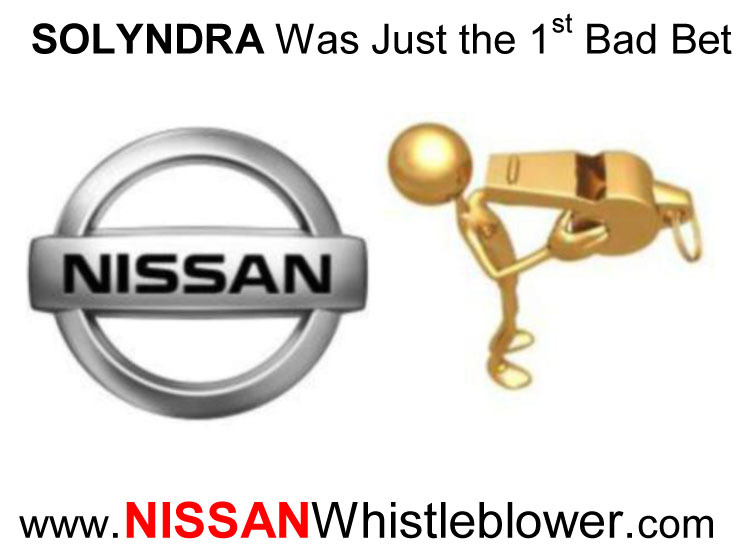 A NISSAN corp. services Director said I was the companies #2 Security threat. Senators... 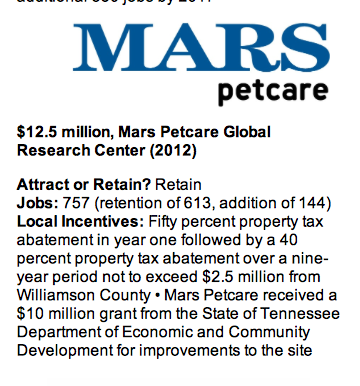 I was the "relocation consultant". People in the community were told I was a "gay" "crazy" and a "spy." What was done to discredit me was excessive. 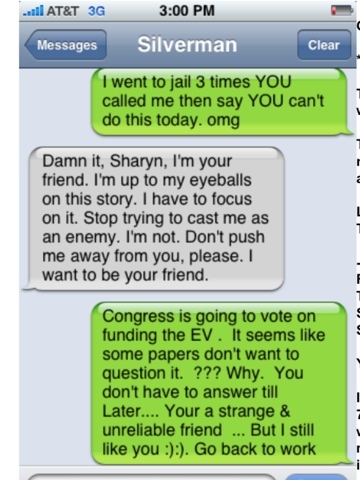 The men were accused on January 3rd 2011 the same day I was meeting in DC to talk to people about the NISSAN fraud. 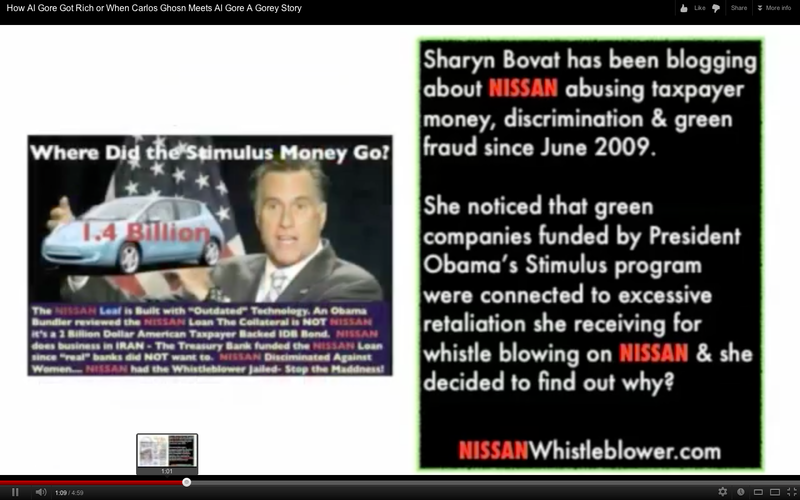 That same 24 hour time period a Federal judge ordered NISSAN to open their books in Bermuda....maybe a coincidence? The second week of January I learned they were innocent and started a viral effort to have them vindicated. I found out about a week after they were accused that they were indeed innocent by "contacts"... Because I'm a "former Cold War researcher"...I did a press release saying they were innocent at the same time the NISSAN CEO said he had "multiple proofs" they were guilty. The fact is the "proof he paid for" hadn't been completed. My viral effort stopped the framing of the me. It gets more complicated but I think you get the "idea." The three men after I was able to convince the French to expedite the investigation were found innocent and vindicated in less than a few month. 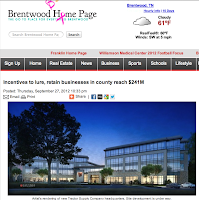 By spring they had gotten settlement checks and their jobs back. All I'm asking for is RESPECT like that they received. FYI- The NISSAN CEO Carlos Ghosn got his "jump start" in business by using contacts of his Brazilian father who was part of Operation Condor. Mr. Ghosn had nothing to do with that (to my knowledge) he did however play a role in Iran Contra and "most likely" the Cover Up of the crash of Pan Am flight 103 over Lockerbie. http://senatordiannefeinstein.blogspot.com/2012/10/cia-dia-what-difference-one-letter-makes.html Fun Fact: The first female President of Brazil is asking for a "truth" investigation about Operation Condor. 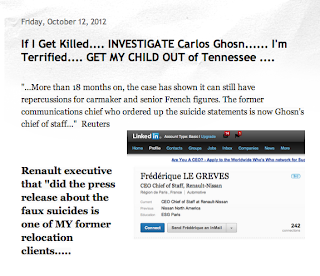 Knowing that I Carlos Ghosn feared being "outed" for his past I put EVERYTHING I know on blogs so they would have NO REASON to kill me. 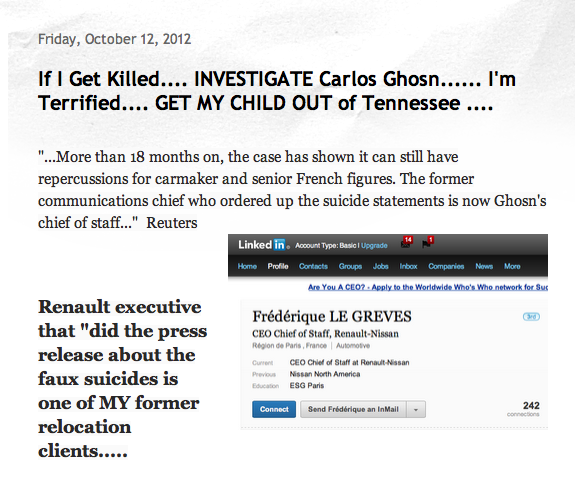 FYI- A friend of the late Marvin Runyon told me about the 'faux suicide" of another NISSAN whistleblower in Tennessee. Mr. Runyon was connected to the CIA. HELLO Tennessee - PTSD is real. Nissan used my words about PTSD to discredit me. I'm worried about women coming back from Afghanistan. NOBODY deserves to be treated disrespectfully - especially those of us that have served America. I have the transcripts and I'll share them with you. Anyway - I think the bullying of me has more to do with "my past" than what they accused me of. TWO TIMES I was jailed on a "trumped up" stalking charge and BOTH times they were dropped. Why am I still being BULLIED? It's because of my connections in the intelligence community and the CEO Carlos Ghosn is connected to powerful people and they are scared about "what I know." they really should not be...OK....YES!! they had a reason to fear me and their bullying BACKFIRED..... I put it all on a blog. Everyone knows that I had to blog about Iran Contra and Lockerbie "just to stay alive"...Remember I was silent until NISSAN "outed" me. 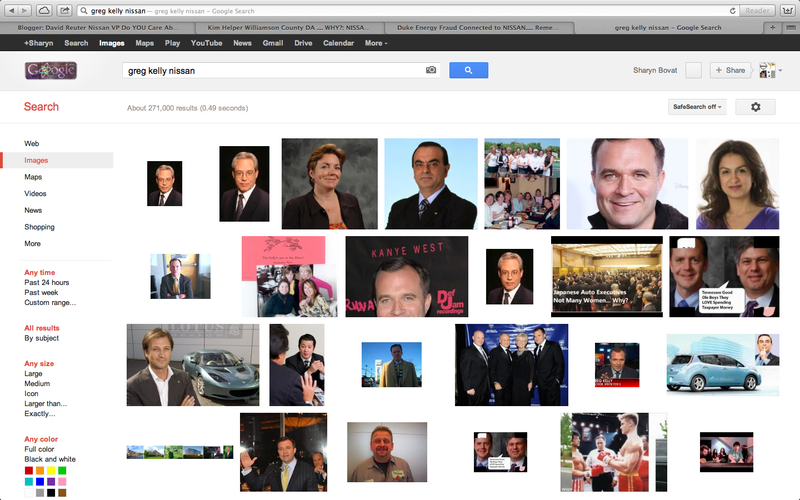 The man that's been married to me for over a decade did not know I did research work until "this" happened. The retaliation for whistle blowing has been severe- I've been "stalked" and followed by people connected to NISSAN and their goal of intimidated me was SQUASHED because kind people communicated to me that they were using the same tactics on me that they use on people that even "suggest" on going union. Senators you've got some "mean" boys at NISSAN and I'm tired of fighting them. They have used the judicial system to bully me in the criminal courts and NOW they are doing the same in the Civil courts. I will not "cave" what they did is morally, ethically & legally wrong. Sir's I can publicly ask for mediation because in reference to the malicious prosecution of me...Because you don't need to hide your cards when you hold all the aces. Senator Johnson - SInce Scott Becker wants to "drag out" this at the expense of the taxpayers then OK.
Next week I make my 9th trip to DC I will go find a Federal route. DISCLAIMER... 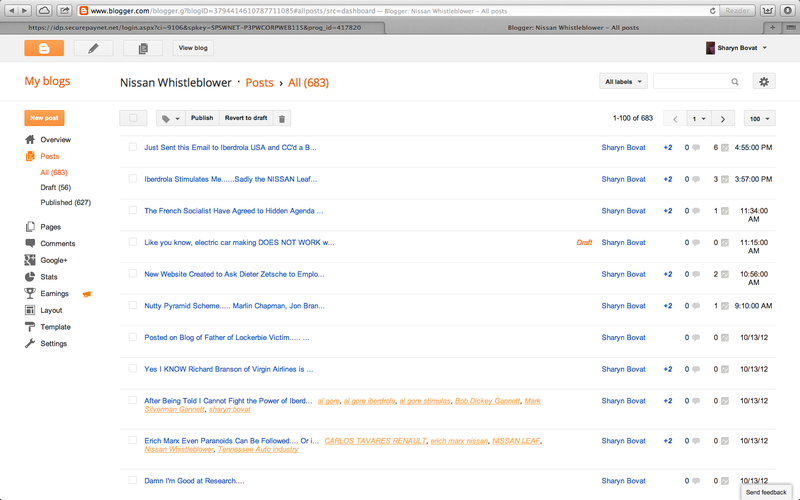 I have NO idea what's being investigated because people that meet with me know that I blog. So a RICO investigation could already be in the works if not I'm leaning toward wanting one. Too many people have "hands in the cookie jar" and it's time for the taxpayers to get RESPECT!!! 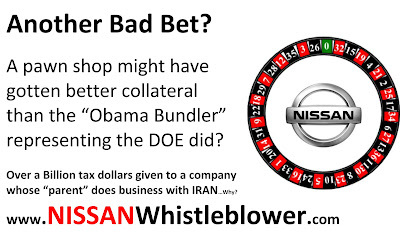 All I know is people can't figure out WHY NISSAN won't mediate? 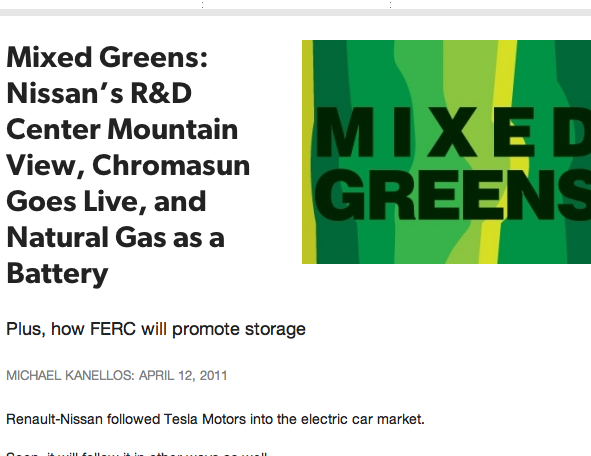 Is NISSAN gonna be ballsy & try to get more bond $$$? It was odd that NISSAN got 37 million in December 11 AFTER I spoke in Sept. and November 2011. 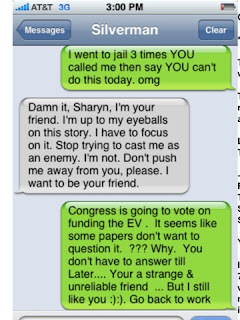 I clearly stated in my Sept. Testimony about the EV fraud, wasted spending of taxpayer money and judicial retaliation at the capital. BOTH of those are in the states archives. 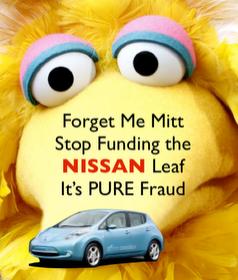 Maybe I'll cc lots of people in hope of someone reading this that can communicate to NISSAN that if I have to spend ALL my time seeking justice that might mean some of the NISSAN executives get to go JAIL. Maybe that's not a bad idea? The FRAUD to America is real. Still I have a child whose suffered for OVER 3 years and I many my life back. 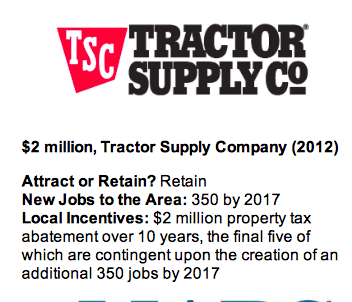 Also I want OUT of Tennessee. I've got PTSD and this state scares me. 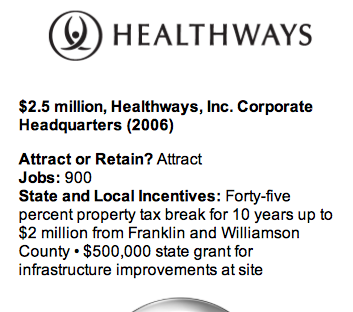 The irony is I used to be considered one of the top relocation consultants for people wanting to move here. 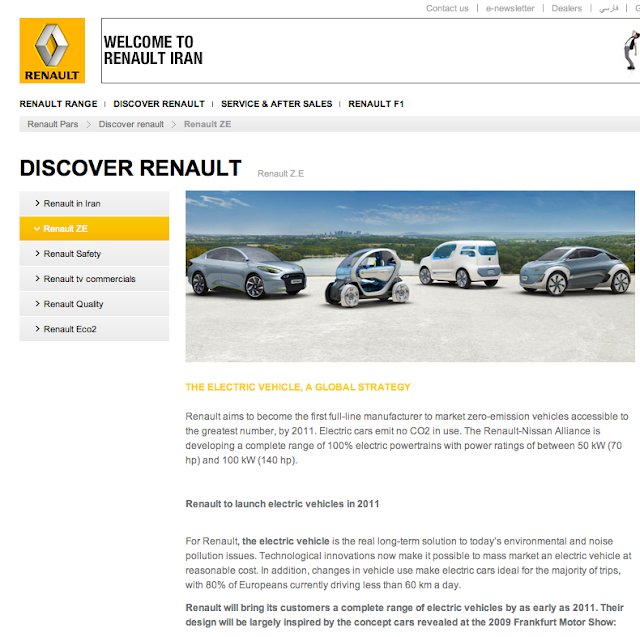 www.TennesseeRelocationAdvice.com If the Three men accused of being spies at Renault got to mediate... Why can't I? Senator Finney you're my hero for being the 1st member of the Senate to offer sincere assistance. Thank you. 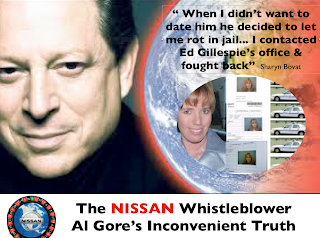 Al Gore's Inconvenient Truth....Larry I'm Finally able to explain this twisted mess.... Hope your feeling better? 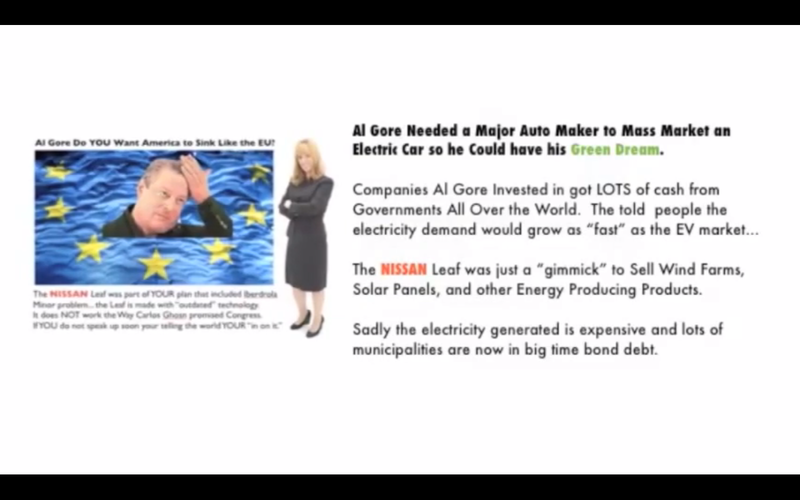 Al Gore’s green friends used to read my blog... in 2009 I wrote about the need for the electric car and wrote why America needed to be energy independent. 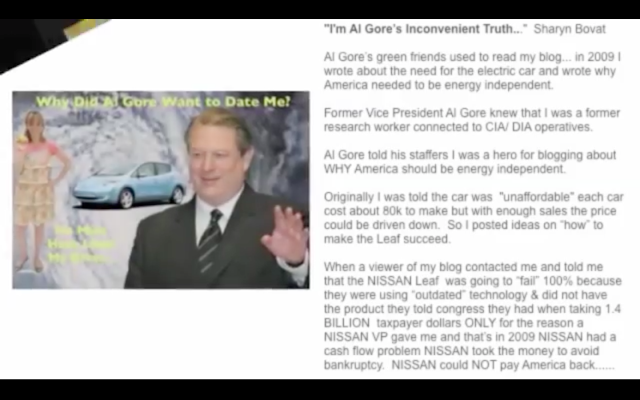 Former Vice President Al Gore knew that I was a former research worker connected to CIA/ DIA operatives. 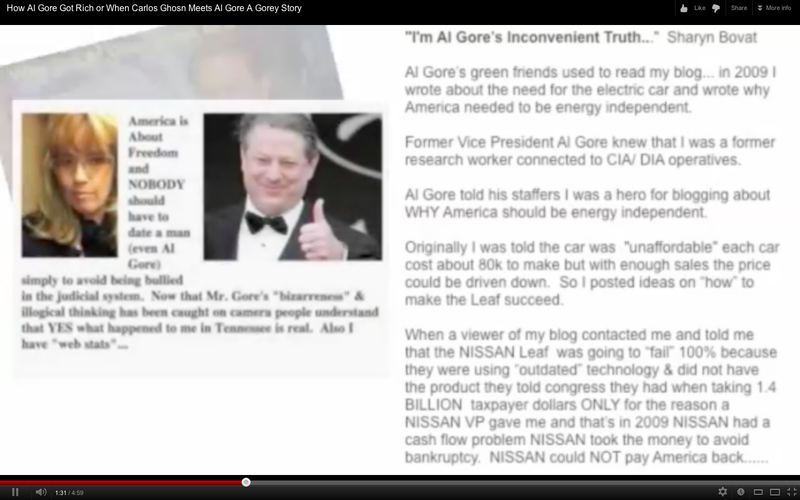 Al Gore told his staffers I was a hero for blogging about WHY America should be energy independent. 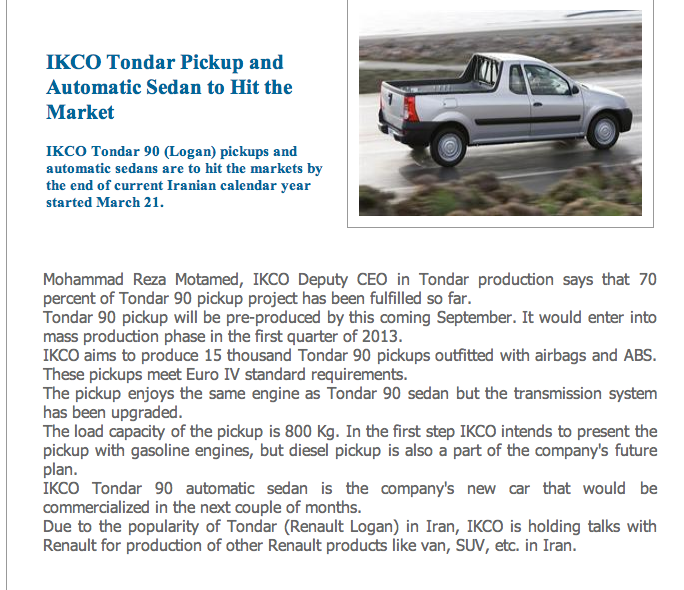 Originally I was told the car was "unaffordable" each car cost about 80k to make but with enough sales the price could be driven down. So I posted ideas on “how” to make the Leaf succeed. Viewers of my blog contacted me and told me that the NISSAN Leaf was going to “fail” 100% because they were using “outdated” technology & did not have the product they told congress they had when taking 1.4 BILLION taxpayer dollars. 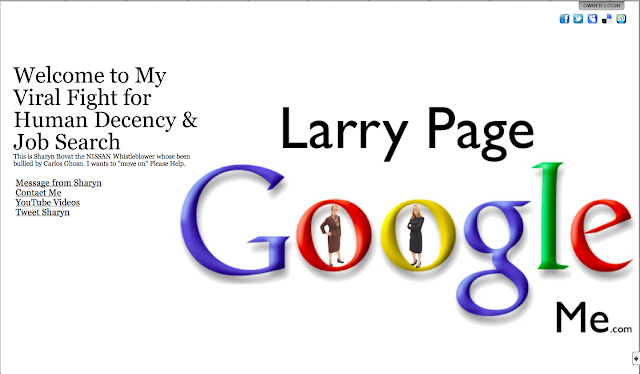 Larry Page... Please Read This YOU'LL See that Nissan His "Issues".... I Want My Life Back... I Hate Being a Whistle Blower..... Please Sir.... Ask NISSAN to Mediate and to Give Me My REputation Back... Thank You..
For NISSAN to get MORE taxpayer money when they have a "track record of NOT honoring their commitments. A guy in NISSAN management came up to me in a parking lot and said: 831.... I was huh... he said YOUR right they lied about all the jobs in the HQ all we have is 831 and it looks like their outsourcing more jobs. Speaking of outsourcing some people were relocated to Tennessee and the Veeps know that about 80 employees would lose their job within a year. So these people that uprooted their families became unemployed. Their jobs to India. NISSAN Vp's had interviewed their replacements BEFORE they left California.... It's disgusting!!! 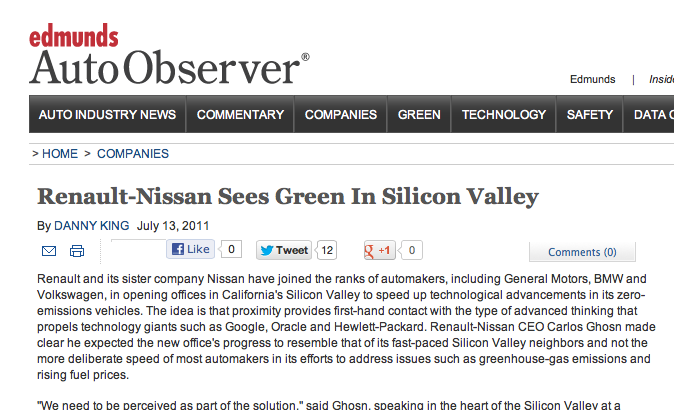 People know that a Good Ole Boy network dominates NISSAN... they fear them. I'm the only one that had the balls to look them in the face and ask WHY were they wasting taxpayer money? They did not like me for questioning their ethics. 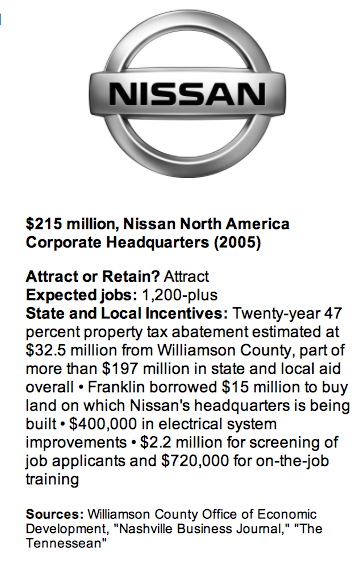 ALL I want is for NISSAN to Mediate and to get the **** out of Tennessee.. I have NO Respect for this state of corruption. 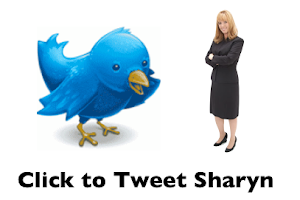 My name is Sharyn Bovat and I got in trouble for speaking out on "how they were spending our taxpayer money. 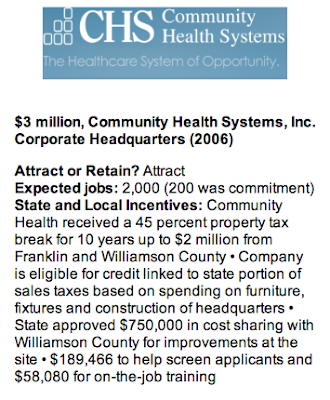 Want to hear about YOUR tax dollars funding my hunt to find a spa for Oxygen Facials? NISSAN delayed responding to a Malicious prosecution case about the bullying of the whistleblower filed in JULY. Then they respond just weeks before the election. They worded their response in a way that SLANDERS me. 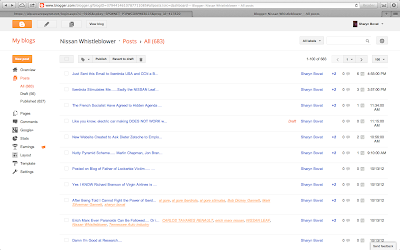 FYI... almost every paragraph they say i was arrested for Stalking/harassment. YES!!! I was on "trumped up charges" TWICE and BOTH times the charges got dropped. THAT IS WHY I FILED the MALICIOUS PROSECUTION. 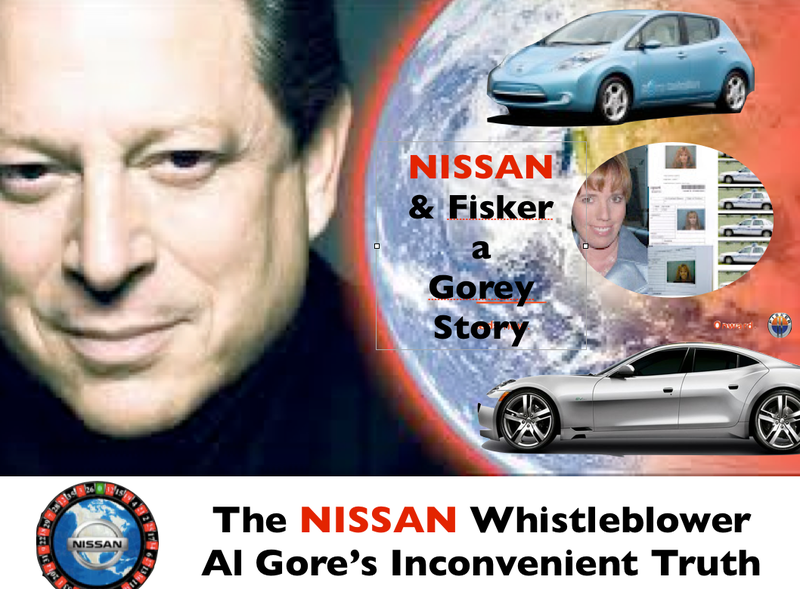 Now my friend Mark Silverman says they "most likely" did it on purpose so if a news agency looks at NISSAN's response they'll read about how a jury indicted me. 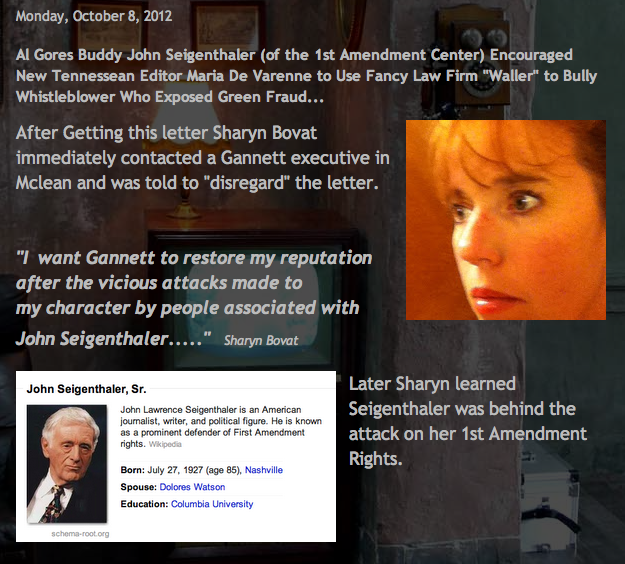 In Tennessee Grand Jury's are known to indict ANYTHING!!! 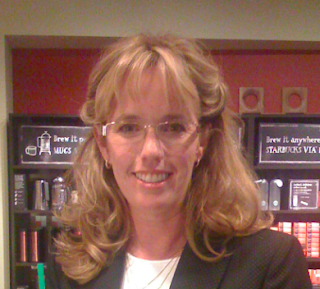 If a reporter wants a copy of the transcripts of the Jury trial of a 1st time misdemeanor call Sharyn 615-415-6675. I have emails and proof that I can show WHY I did what I did. In 2009 I was told that I could be a Catalyst for change at NISSAN. People gave me information to blog about. They wanted me to do what I do. My child does not need a mommy that's fighting for her reputation... 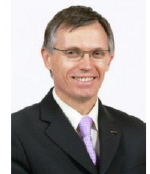 I will show you an email I received from Carlos Tavares in 2010. I will show you that people wanted me to expose that the battery was made with outdated technology. We will work out a way that I get my dignity and you get to keep enjoying the tax breaks with out me "ranting about the Leaf...." I'm serious. My child is suffering. This needs to be resolved. 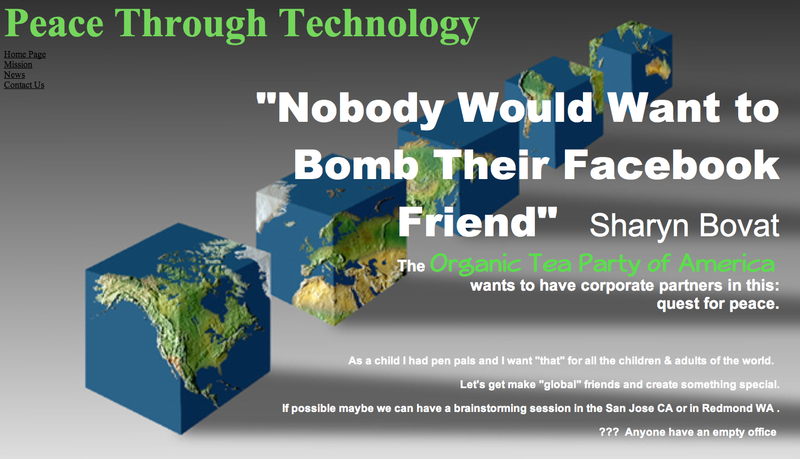 If what I did was ALL about money I would have taken the money HR VP Mark Stout offered me in 2009. My blogging has been about "fairness" for all Nissan employees and for discrimination to stop.... and I'm realizing that in America it does not exist. What I want is what's fair and I want my REPUTATION back. A former NISSAN employee who has access to Carlos Tavares and he's asked if me he can reach out to him. He sees the pain I'm in... I'm going to tell him to "do it" maybe the future CEO of NISSAN to to be a voice of humanity.. After all I Sharyn Bovat "saved the Renault Three"... it's time for me. 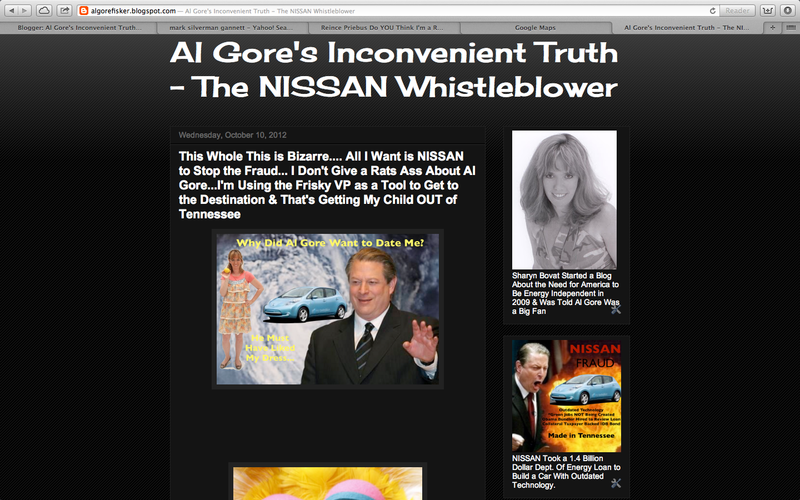 If I were the person the the NISSAN Lawyers described Al Gore would not have read my blog (so much) and "most likely" he would not have wanted to dat me. Also the Ben Bradlee Winning Editor would NOT have been my friend...and he still is... 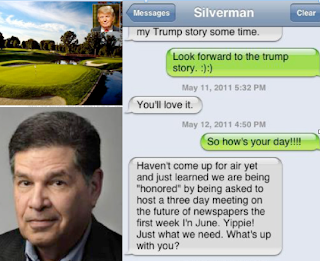 He called me today. 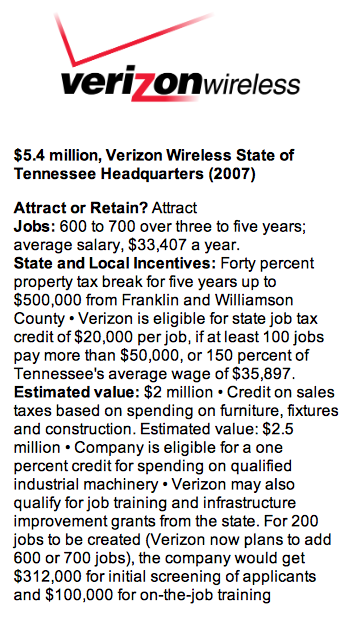 I need OUT of Tennessee and i can't get out until I have a job. I need NISSAN to give me my reputation back..
ALL I want is RESPECT!!!! 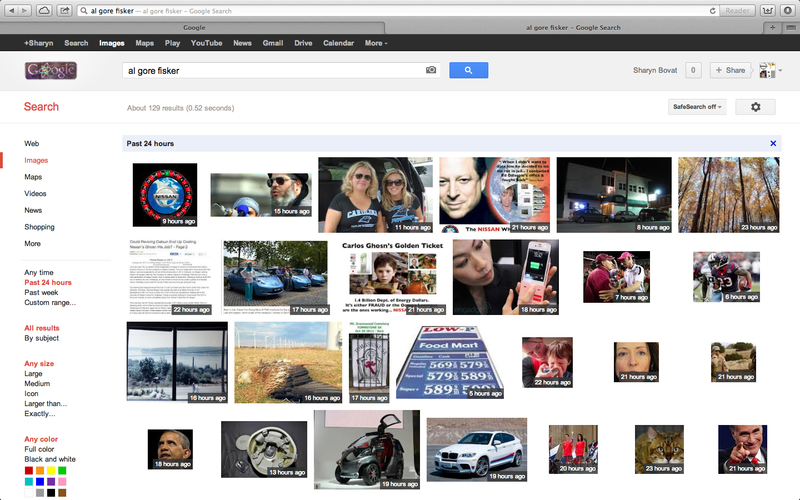 Larry Page Can YOU Please Tell NISSAN to Mediate? Based on the response provided by Baker Donelson NISSAN is blaming the ENTIRE Malicious Prosecution of Me Sharyn Bovat on the State of Tennessee. 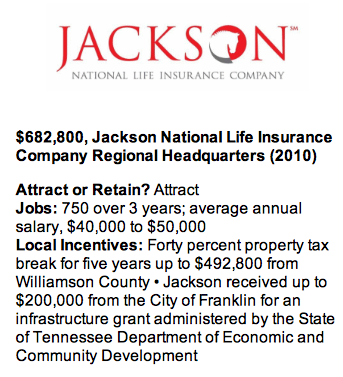 The fact is NISSAN paid a Lawyer Joe Baugh who was the former DA of Williamson County to persecute me. He babysat the case the entire 19+ months. 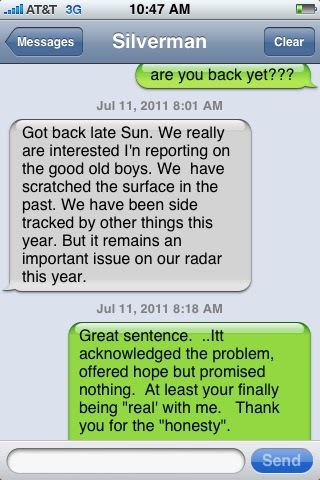 In the summer of 2010 Joe Baugh offered to have me to his office for coffee and "he'd make the case go away".... This was after a preliminary hearing in the summer 2010 when I got a "trumped up" stalking charged dropped by Judge Al Nation's. What happened to a woman who spoke up against discrimination (that was proven) and about taxpayer money being spend to build a "car to fail" and that's being proven. to prosecute me for over 19 months is wrong.... NISSAN paid the lawyer who call my lawyer in the summer of 2010 and the NISSAN lawyer told him that they were going to keep arresting me and that my case would be too big for him. 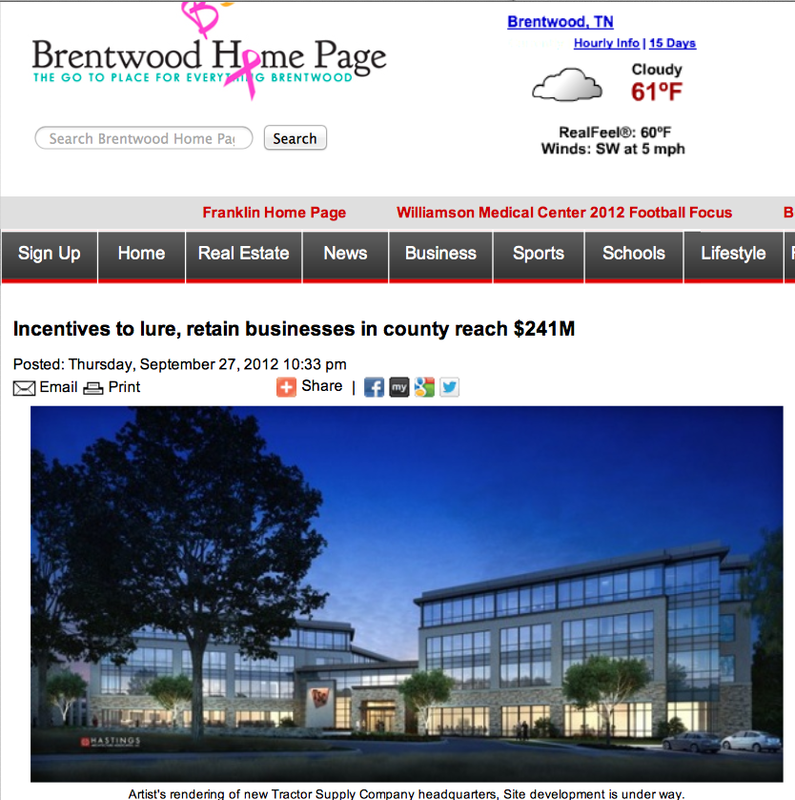 Terry Wood the ADA is being blamed for the continued persecution of me... The fact is "someone" pressured him to do it... WHO? Guess we'll find out with depositions. I will fight for what is morally right. I want my reputation back. Since NISSAN wants to keep this going I need to work and need health insurance. 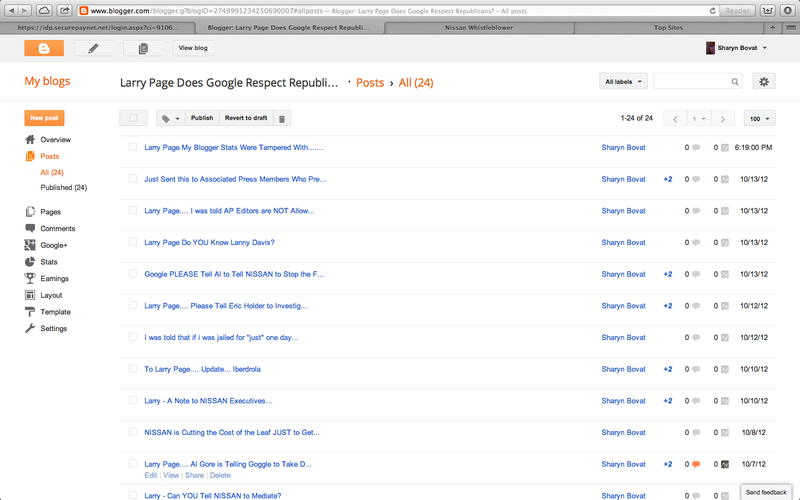 If anyone needs a bloggger call me (615) 415-6675. 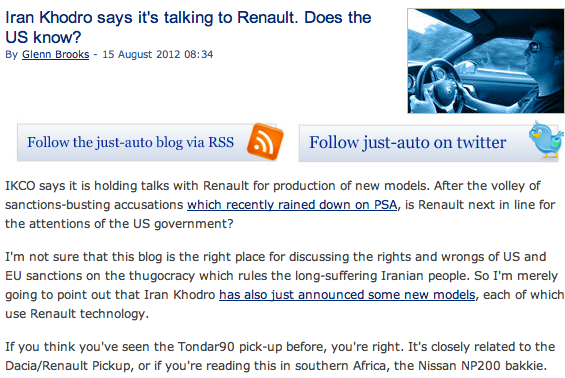 I"m putting all that's on this blog in "draft mode"... the people that led effort to discredit me were from NISSAN. I"m tired and can't believe that this is continuing. I expect it will be restored soon? 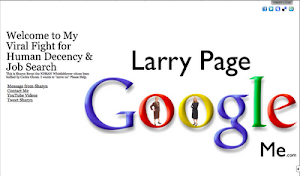 Larry Page Do YOU Know Lanny Davis? 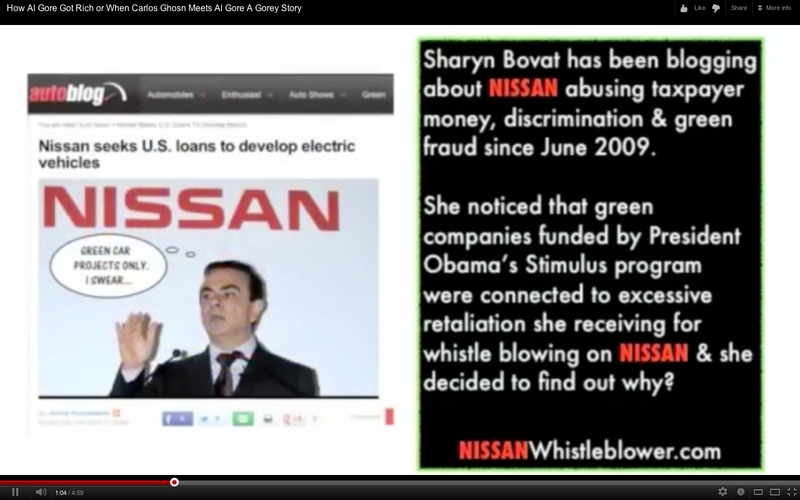 Larry - Can YOU Tell NISSAN to Mediate?